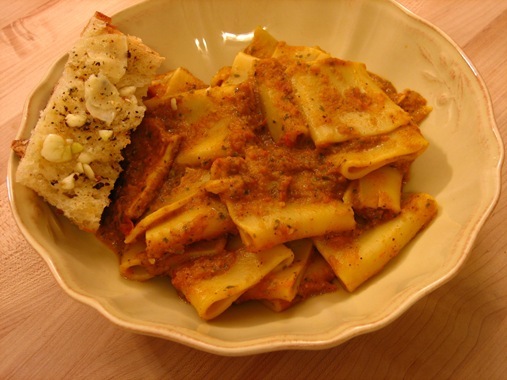 The chilly, windy weather outside made me want to cozy up with a big bowl of spicy, saucy pasta. So, I fired up the oven and roasted some tomatoes, onions and garlic. The freshness of these three, simple ingredients roasted with a splash of olive oil and sea salt is a treat but a sprinkle of vindaloo powder gives it a zing that really heats you up. A few weeks ago, I picked up Vindaloo Curry Powder from Kalustyan’s, a speciality food store in Manhattan’s Curry Hill which carries fresh spices, herbs, teas and much more. Kalustyan’s vindaloo powder is a blend of cumin powder, coriander powder, black pepper powder, cinnamon powder, clove powder, cardamom powder, ginger powder, nutmeg powder, turmeric powder and chili powder. I also picked up Chicken Tikka Masala powder that I’m saving for Unchicken Tikka Masala. I don’t usually buy spice blends but these are two basics that are handy to keep around. Not to mention, if I tried to combine that many powders in my kitchen, I think it would explode! Spread olive oil along a baking tray and line it with the tomatoes (skin side down), onions and garlic – rub a little olive oil onto the top of the onions and sprinkle with sea salt. Roast in the oven on 350 degrees for about 45 minutes. Once cooled, peel the garlic cloves and blend the tomatoes, onions and garlic along with 1/4 cup of water until pureed. Add pesto sauce, vindaloo powder and salt and blend again until well mixed. I made the sauce a day ahead of time and heated it up when ready to serve. I also added a few thin slices of pan fried paneer to the sauce before mixing it with the pasta. Tofu or any other soy protein would be a good substitute for paneer. We had our vindaloo sauce with wide macaroni noodles to allow for ultimate coating and chin dribbling goodness but any noodle would do. Serve along with crusty garlic bread to sop up the sauce. *I found 2 tspn. of vindaloo spice to be spicy enough, but you can add more to taste. 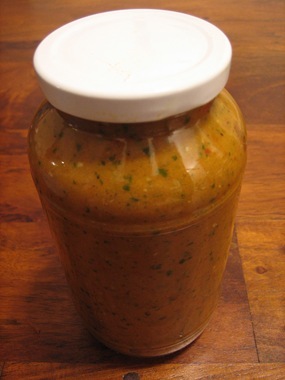 A pre-made vindaloo sauce (usually sold in the dairy, refrigerated section or the “ethnic” aisle) may be a good substitute for vindaloo powder if you can’t find it in your market.